LONDON - Endemol has acquired UK producers Tiger Aspect, Darlow Smithson and Tigress from media group IMG, for an undisclosed sum. 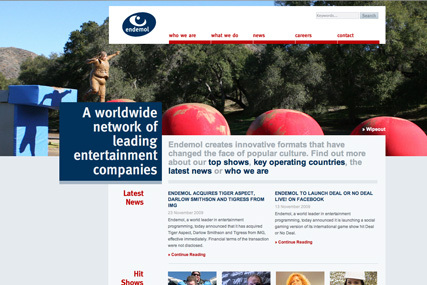 The company will represent the portfolios of all three companies via Endemol Worldwide Distribution. Tiger Aspect, Darlow Smithson and Tigress will now report to Endemol UK. Tiger Aspect Productions specialises in genres including drama, comedy, animation, children's and entertainment. Its shows include Secret Diary of a Call Girl and Ross Kemp On Gangs. Darlow Smithson Productions specialises in documentaries and dramas. Recent credits include The Falling Man and Touching the Void. Darlow Smithson also incorporates Tigress Productions, which specialises in wildlife, science and adventure documentaries.